Summer has finally arrived and that means picnics, hikes, trips to the lake and ticks. Ticks are not only a nuisance they are a dangerous insect that can lead to Lyme disease, Rocky Mountain spotted fever, babesiosis, and now according to University of Virginia a meat allergy. University of Virginia researchers announced last week that they have found a connection between Lone Star Tick (Amblyoma americanum) bites and allergic reaction to meat. This new allergy to meat called Alpha-Gal presents itself 4-6 hours after consumption of beef, pork or lamb and symptoms can vary between hives to anaphylactic shock. So far, doctors have diagnosed over 1,500 people with Alpha-Gal as a result of Lone Star Tick bites. “The Deer Tick which is the largest cause of Lyme disease generally gets most of the focus when speaking about tick bite prevention and treatment. However, it is important to know that any tick bite carries the risk of side effects, which could include anything from a rash to babesios,” says DeerBusters.com General Manager Mark Dayhoff. The Deer tick and Lone Star tick also share primary hosts. 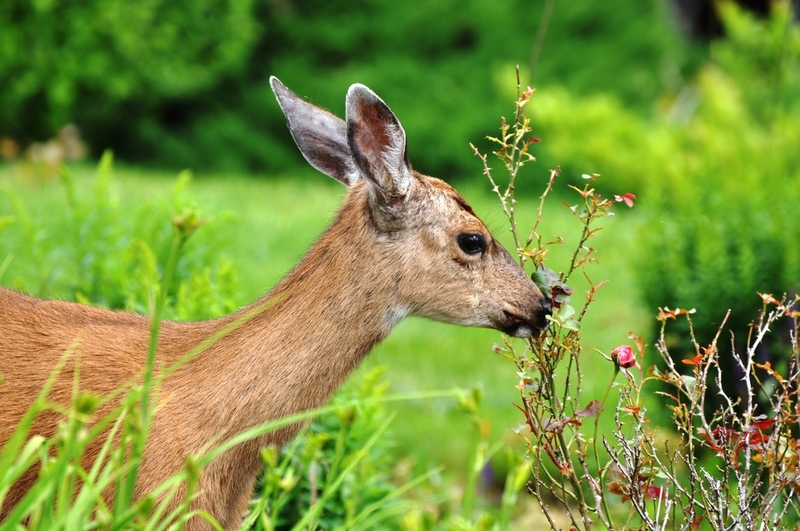 The CDC (Center for Disease Control) states that the, “White-tailed deer are a major host of Lone Star Ticks.” This parallels findings in the study, which show a majority of patients diagnosed with Alph-Gal live in high deer populated areas. One of the best methods to limit the risk of tick bites is to keep grasses cut regularly, clean up leaf litter, to avoid known deer paths and with the installation of deer fencing in populated areas. The National Center for Biological Information, a division of the National Institute of Health states that use of deer fencing has been proven to reduce the presence of ticks inside the enclosure by up to 90%. While similar in appearance to the Deer Tick the Lone Star Tick can be identified by its white dot in the center of its body. Although the Lone Star Tick is not known to transmit Lyme disease it does carry ricks of STARI (Southern Tick-Associated Rash Illness), Tularemia and now Alpha-Gal. The Lone Star Tick is widely found from Rhode Island to Florida and as far west as Texas and Iowa. DeerBusters.com specializes in award winning virtually invisible deer fence, baited electric deer fence, deer repellents, dog fencing and wildlife control solutions for consumers and professionals. Designed for easy homeowner or landscaper installation and with over 25 years of experience, DeerBusters.com has established a reputation as an industry leader. Whether the property is a small residential yard or a large-acre farm, DeerBusters.com has a solution for wildlife problems. To learn more visit DeerBusters.com or call 888.422.3337.